Guest conductor Bill Smith leads the Symphonic Band in Bravura March. 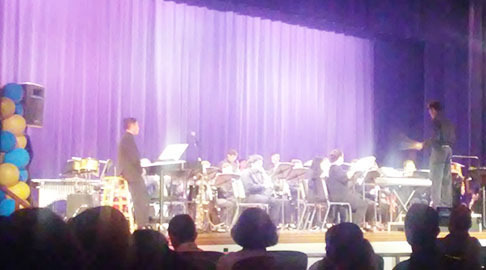 On Thursday, May 24th, the band program’s Spring Concert was held in the auditorium, featuring separate groups and soloists. The Beginning Band performed Mary Ann, Sawmill Creek, E-Flat Concert Medley, Loch Lomond/ Shalom Chevarin, Ricochet Rock, and Kumbaya. The Intermediate Band performed Paso Flamenco, Dance of the Tumblers, and Doo Wah Dixieland. The Chamber Group of clarinetists Camilo Alvarez and Eddy Santiesteban played Rondeau Gracieuse. The Chamber Group of flutists Sara Denlinger and Kimberly Garcia performed Duetto. 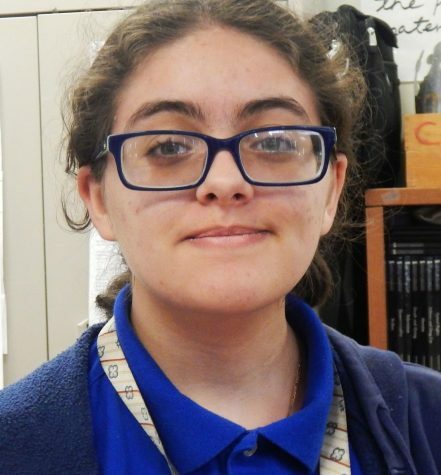 The Chamber Group of flutists Olivia Martinez and Isabella Mendietta played Echo. The Jazz Combos played In a Mello Tone, Bossa Bossa, Canteloupe Island, Autumn Leaves, Doxy, and Cha Cha-iando. The Full Jazz Ensemble performed Mambo Inn and Salt Peanuts featuring guest soloist David Fernandez. The Symphonic Band first played Bravura March featuring student conductor Bill Smith. Next, student conductor Eddy Santiesteban, led them in Holst’s Suite in F, Movements 1 and 4. Symphonic Band also performed Schubert’s Unfinished Symphony No. 7, Movement 1 and Camino Real. What did you think of this story? Would you like to see more stories like this? Tell us what you think in the comments below!